Get more tenant traffic with on-demand showings, any day of the week. Prospects interested in your listing can schedule a showing at their convenient time, any day of the week. They simply call our 24/7 booking hotline and our Property Concierge Team is ready to help. Once a showing is scheduled, one of our professional Mobile Managers (preferably one nearest to the property and who has previously shown it) will be given complete details of your listing and access instructions. Our Mobile Managers are trained to welcome prospective renters and give them a positive experience while showing your property. If possible, they will show your listing to multiple prospects at the same time to create a semi-competitive environment. We get feedback about the showing from both the Mobile Managers and prospects to see if we should move forward. Prospects will also receive a link with instructions on how to apply to prompt them to take the next step. We make it fast and easy for our Mobile Managers to show your rental any time by installing a lockbox on-site containing your property’s keys. We’ll soon be adding our industry-leading model for autonomous showings with Smart Showings. This will allow temporary and monitored access to your rental to initially pre-qualified prospects whose identities have been confirmed. If you opt in, we will provide and install a Sesame Smart Lock that fits over 95% of existing deadbolts. 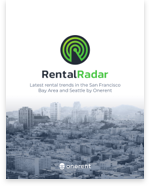 Contact partners@onerent.co to learn more about the ultimate smart rental experience.